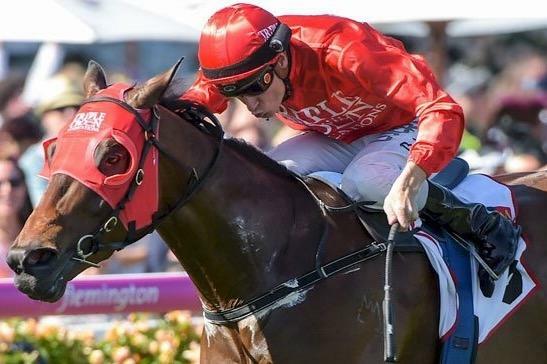 In one of the boldest riding moves of the Melbourne Cup Carnival, Redzel blistered down the outside track solo to take out the $150,000 Listed Mumm Stakes (1000m) at Flemington on Oaks Day. Partnered by Blake Shinn, the Triple Crown-owned son of Snitzel jumped from the widest barrier (13) and took up the running one out for an exciting all-the-way win ahead of Group 1 stalwart Terravista. When asked about the tactical decision to fly solo, Shinn said because the track played favourably towards the outside on Melbourne Cup Day, it was always going to be the plan to head that way regardless of what his peers would do. “The plan was always to head to the outside. We drew 13, the track played favourably towards the outside on Cup Day plus having the rail on his natural side was also very important. “When I pushed the button he had a strong kick. Because he settled well and breathed well, it allowed him to pull off some nice sectionals, and finish off strongly. Co-trainer Peter Snowden was not surprised at all with the victory, saying the horse had well and truly earned his ticket to compete at black type level. “He’s proven at this level now. He’s been going through his grades beating handy horses and racing well against them so he’s earned his ticket to take on these sort of races on now. “It was our plan to go to the outside, regardless of what the other horses did.He was going to be in front anyway so not having horses around him wasn’t going to matter,” added Snowden. All going well, Redzel could potentially line up next in the $100,000 Magic Millions Classic (1100m) at Ballarat on November 19 in the clockwise direction while the Group 1 Lightning Stakes (1000m) at Flemington is a long term target to consider early Autumn next year. Words: Sarah Peatling – Snowden Racing. ← Red hot Redzel does it again.